I love get togethers. I'm a big fan of having somewhere to go, having something to do, and most importantly having a reason to bake something I would otherwise never make. Like this cake. This delicious, delicious, delicious cake. You see, the last thing I need is a big cake like this sitting around in my house. Because you know what will happen? I will eat it- all of it- and maybe share a tiny corner with John. So really that doesn't work. Recently my uncle had a birthday to celebrate and I quickly volunteered to bring the cake. My uncle is not picky and will eat anything (except peanut butter- weird...) so I had plenty of options to work with. 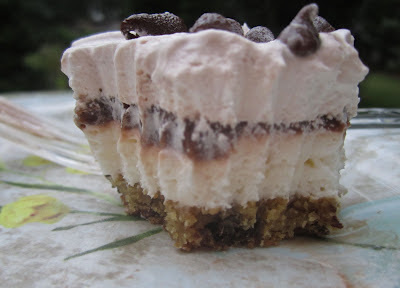 I finally settled on this recipe because of the cream cheese layer. It was reminiscent of cheesecake, his ultimate favorite, but not as heavy and dense as a cheesecake. When all was said and done this recipe was divine. We all ate it and loved it. My cake doesn't have the perfectly aligned layers as the original recipe's picture shows, but hey- I'm just your average home cook! I am not claiming to be a master chef 'round here! What I am claiming though is that I can make one mean dessert- and this was unreal. Try it- now- right now- go- run- go make a cake! 1- Let cookie dough stand at room temperature for 5-10 minutes to soften. Press into an ungreased 13-in. x 9-in. baking pan. Bake at 350° for 14-16 minutes or until golden brown. Cool completely on a wire rack. 2- In a large bowl, beat cream cheese and confectioners' sugar until smooth. Fold in 1-3/4 cups whipped topping. Spread over crust. 3- In a large bowl, whisk milk and pudding mixes for 2 minutes. Spread over cream cheese layer. 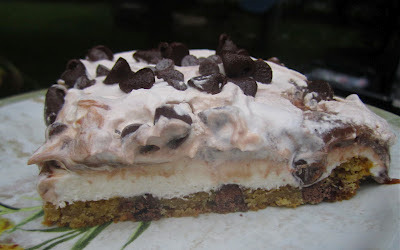 Top with remaining whipped topping and chocolate chips. 4- Allow to sit in the fridge overnight or at least 8 hours. Oh so good! My family would love it! I'll make this next time the kids come to visit. I wouldn't dare be home alone with a pan of this in the fridge!